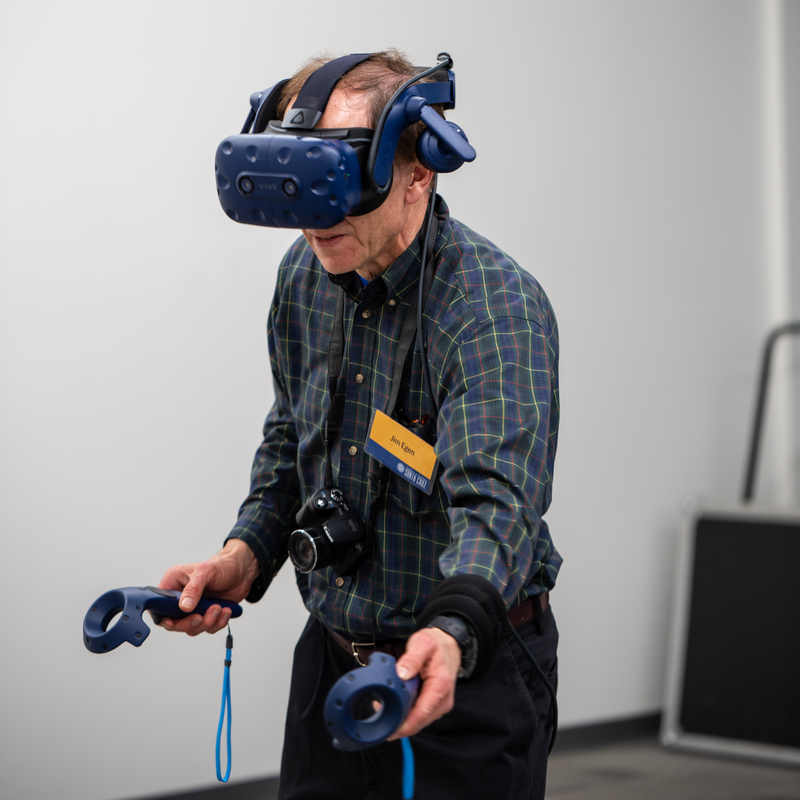 Jim Egen dons a virtual reality helmet and paddles to test ASSIST lab's stroke rehabilitation game. The Baskin School of Engineering at UC Santa Cruz announced the launch of the country’s first professional master’s degree program in serious games. UCSC already offers two of the most highly rated game degree programs in the country: the B.S. in Computer Game Design and the M.S. in Games and Playable Media, both in the top 20 of Princeton Review’s Top Game Design Schools. The emphasis on serious games will give students an entry into a field which is expected to grow from $5B to $15B over the next few years, and will capitalize on the school’s existing expertise in assistive technologies, games and playable media, digital art and media, psychology, and many other disciplines. The degree consists of five academic quarters and trains students in six key areas: game design, game technology, eliciting and integrating subject matter knowledge, designing and conducting efficacy measurements, effective teamwork, and career planning--all within the context of the serious games field. It will culminate in a capstone project. The program’s location in the heart of Silicon Valley and its faculty’s close relationships with industry also will create ample opportunities for students. Faculty members from the computational media department, including Professors Nathan Altice, Angus Forbes, Katherine Isbister, Sri Kurniawan, Michael Mateas, Edward Melcer, Adam Smith, Noah Wardrip-Fruin, and Jim Whitehead will teach the new serious games curriculum. The program is directed by Michael John, who has over 25 years working with serious and entertainment games. The professional master’s programs at the UC Santa Cruz campus are designed to replicate and accelerate the process of learning from experience. Another key skill for serious games development is presenting one’s work. Attendees of the December 5th 2018 Kraw lecture at the UC Santa Cruz Silicon Valley campus got a triple treat: Roberto Manduchi’s keynote discussing assistive technologies for the blind, and then a double dose of serious games, including some created by the first cohort of serious games students. Computational media Ph.D. student Jared Duval presented his work on SpokeIt, a game that turns the grueling work of speech rehabilitation for orofacial cleft patients into fun. Stage left were demonstrations of projects-in-progress, set up for the guests to try: these included an unnervingly accurate suicide hotline simulator, a climb up Mount Everest that focused on blood chemistry, a virtual-reality game designed to fix lazy eye, and several language education tools. Much of the credit for the UC Santa Cruz’s early emphasis on games goes to Professor of Computational Media Jim Whitehead. In 2004, during the post-dot com doldrums, Whitehead created an undergraduate degree that catered to computer science students who wanted experience with computer game development as well as code. At the time it was one of the only computer game focused programs in the country. Students flocked to the program. During the past decade, banana slug alumni have helped create the latest generation of games. Whitehead sees the same thing happening with serious games. Those divergence points provide rationale for having two separate programs. “If you’re doing a serious game, there’s some sort of outcome expected, and it’s really important to measure whether you’re getting there or not. So there’s an important assessment component.” Designing games with assessment built in seems like a subtle distinction but often requires an entirely different design philosophy. The other reason, according to Whitehead, is that the cohorts are quite different. The traditional gaming community can seem clannish and forbidding for outsiders to break into. Serious games, as an entirely new field, represent an amazing opportunity for a much broader segment of the population to apply the tools created for gaming to entirely new problems. For example, historically, most serious games have focused on education. But the work of Professor of Computational Media Sri Kurniawan has a more tangible focus: health and wellbeing. She sees enormous potential in serious games, particularly for populations with special needs like people with disabilities, from low socioeconomic or educational backgrounds, or the elderly. Creating a game for health requires coordination between multiple stakeholders and often very different specialities. UC Santa Cruz is famous for cross-disciplinary symbiosis, making it an ideal place for serious games. Professor of Computational Media Edward Melcer teaches the Fundamentals of Serious Games class, required of every serious games graduate. Applications for the M.S. in Serious Games are being accepted until January 24, 2019. Please visit https://gpm.soe.ucsc.edu/admissions/ for more information.